Click on this link if you need more information about Data Acquisition . The new OM-USB-3101, OM-USB-3103, and OM-USB-3105 are voltage output USB 2.0 full-speed modules. Each module provides 4, 8, or 16 voltage outputs. All modules provide synchronous and concurrent voltage updates. 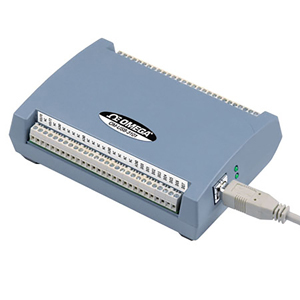 All OM-USB-3100 Series modules provide eight digital I/O lines and one 32-bit event counter and are powered by the 5V USB supply from the computer. All OM-USB-3100 Series modules provide either 4, 8, or 16 channels of 16-bit analog output. Each channel is software-selectable for either a bipolar voltage output range of ±10 V or unipolar range of 0 to 10V. Channel outputs can be updated individually or simultaneously. The OM-USB-3100 Series modules ship with an impressive array of software including the new TracerDAQ®, a full-featured, out-of-the-box data logging, viewing, and analysis application. Driver support and detailed example programs are included for Universal Library programming libraries for Microsoft® Visual Studio® programming languages, and other languages, including DASYLab®, and ULx for NI LabVIEW® (comprehensive library of Vls and example programs compatible with 32-bit and 64-bit LabVIEW v8.5 through 2012) and InstaCalTM installation, calibration and test utility-powerful solutions for programmers and nonprogrammers alike. These modules operate under Microsoft Windows® XP (32-bit only) and VISTA/7 AND 8 (32-bit and 64-bit) operating systems. All OM-USB-3100 Series modules have a synchronous DAC load connection pin (SYNCLD) that simultaneously updates DAC outputs on multiple devices. You can configure this with software as an input (slave mode) or as an output (master mode). In slave mode, the SYNCLD pin receives the D/A LOAD signal from an external source. When the SYNCLD pin receives the trigger signal, the analog outputs are updated simultaneously. In master mode, the internal D/A LOAD signal is sent to the SYNCLD pin. You can then synchronize with a second device of the same type and simultaneously update the DAC outputs on each device. On power up and reset, the SYNCLD pin is set to slave mode (input). All OM-USB-3100 Series modules have eight bidirectional digital I/O connections. The digital DIO lines can be independently programmed for input or output. All digital pins are floating by default. A screw terminal connection is provided to configure for pull-up (5V) or pull-down (0V). Each OM-USB-3100 Series module has a 32-bit event counter for counting TTL pulses. The counter increments when the TTL levels transition from low to high. The counter accepts frequency inputs of up to 1 MHz. Range Selection: The output voltage level defaults to 0V when the output voltage range is reconfigured, the host computer is reset, shut down, or suspended, or a reset command is issued to the device. Host Computer is Reset, Powered On, Suspended, or a Reset Command is Issued to Device: The duration of this output transient is depends highly on the enumeration process of the host computer. Typically, the output is stable after two seconds. Pull-Up/Pull-Down Configuration: Softwareselectable; all pins floating (default). For pull-down, connect the DIO CTL pin to a DGND pin. For pull-up, connect the DIO CTL pin to the 5V pin. Digital I/O Transfer Rate (System-Paced): System-dependent, 33 to 1000 port reads/writes or single bit reads/writes per second. No Load: 0.6V maximum; When SYNCLD is in input mode, the analog outputs may either be updated immediately or when a positive edge is seen on the SYNCLD pin (this is under software control). However, the pin must be at a low logic level in order for the DAC outputs to be updated immediately. If an external source is pulling the pin high, no update occurs. Supply Current (Quiescent): Total quiescent current requirement includes up to 10 mA for the status LED. This does not include any potential loading of the digital I/O bits, 5V user terminal, or the VOUTx outputs. Nota: Comes complete with 2 m (6') USB cable and software and operator’s manual on CD.